There’s nothing like a brand new agenda or notebook to get a girl excited. All those fresh blank pages, full of possibility. That was probably one of my favourite parts of the school year when they handed out the new agenda books. Some years I went over the top with decorations and drawings and one year I actually made my own agenda. Shocking, I know. These day, I’m perfectly happy to just buy a sweetly illustrated agenda and concentrate on all the lists I’m going to fill it with. This is the second year in a row that I’ve gotten one by Shinzi Katoh. I bought it at The Paper Place, one of my all time favourite shops. I couldn’t resist picking up some sweet coloured pens with super fine tips. Everybody knows that if you have the right pens, you’re sure to be way more organized. January is still a ways away, but these agendas start in November, so I can get a head start on that ‘new year feeling’. You’ll notice I also picked up a big fat eraser. I won a vintage schoolhouse pencil sharpener on ebay yesterday! Ooh, I saw one of those pencil sharpeners at an antiques shop at Queen and Roncy the other day (I think it’s called Acadia?). I opened it up and it still had that smell! That lovely, woodsy, metallic smell. p.s. i feel the same way about new journals. which is why i have a huge box full of them in my 29 years of age. You have done a very bad thing to me…I just went to this guy’s website and I have fallen in love. I must try to find his stuff in Ottawa…did you see the super cute lunch boxes!? i have the same one! i bought one exactly the day the calendar book started!!! yay! i totally remember that agenda you made! i coveted it as much as i coveted your tickle-trunk of a pencil case. good times. This is really cute. I LOVE new agendas, fresh notebooks, unused pads of paper. In fact it’s a bit of a fetish. One grade five teacher understood me so well she would periodically give me large cardboard boxes of printers off-cuts — strips of paper bound into bricks….Hoo boy. Did I love that teacher. And good! I was just thinking the other day in class how fitting it would be if you had one of those school sharpeners! that is *so* cute! I have some of the Shinzi Katoh fabric, but I think I’d rather an agenda, the cuteness would make me inspired to be organized!! anabela – i can’t wait to get my pencil sharpener and re-live the memory of going to the back of the class to ‘sharpen your pencil’ aka drop a note on your friend’s desk, take a peek at your current crush & avoid doing school work. bobbinoggin – for me the important thing about pens is that they have a really fine tip. i had a diary when i was younger that i would not write in unless i had a fine tip pen. lol. 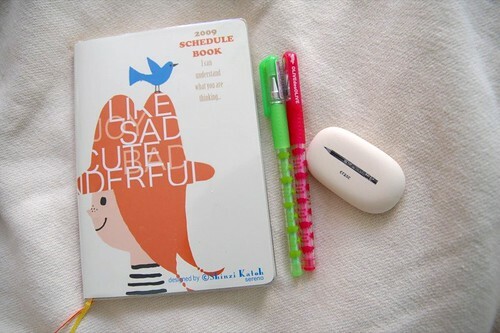 jenny f – agendas definitely lend to the illusion of being organized and studious. i really just love the feeling you have with a new one that this year WILL be even better. heather – his little bento boxes and water bottles are cute! everything he does is crazy cute. i hope to order some of his fabric for the shop. i may have to order some of the other cute stuff too. rosalyn – yeah! we’re agenda twins! celine – i KNOW, i’ve needed the pencil sharpener at the shop so badly. but i couldn’t just buy any old sharpener. it had to be ‘perfect’. the day it arrives, i’ll sharpen up all those dull pencils i’ve got. I didn’t realize that not a single pencil there has a point whatsoever. amanda elizabeth – i don’t know how i would ever decide what to make with his fabric. it’s so precious. how long have you had it in your stash?